The GMC Acadia is the first crossover utility vehicle for GMC. Powered by a 3.6 liter V-6 engine supplying 288 horsepower. Features found on the 2011 GMC Acadia includes cruise control, power windows/locks, rear under-floor storage and XM satellite radio. Electronic navigation, rear-seat entertainment system and a heavy-duty trailer equipment package.The Acadia Denali debuts fitted with trim-specific 20-inch aluminum wheels, HID headlamps and a high-class exterior as well as interior featuring perforated leather seating and wood accents. 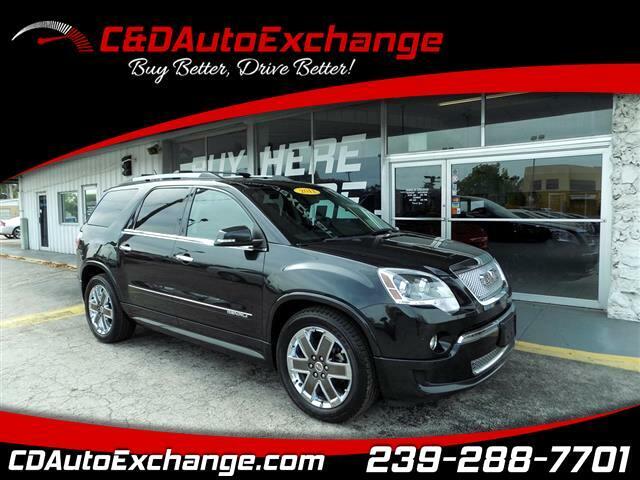 A must see if looking for the right SUV for a growing or large family. 120 Point mechanical inpsection passed and certified. Call our Fort Myers location at 239.288.7701 or apply online.